Marcel Holle, one of the team guides, took many nice photos of BOI 2013 – many thanks, Marcel! … Mårten Wiman of Sweden – Congratulations! Find the full result table on the Competition page. Congratulations to contestants from Poland, who (again) dominate the BOI ranking. Day 1 of BOI 2013 saw phenomenal results: six participants with a full score of 300 points! Now the second day is running, and there is roughly 100 minutes left to apply the final tweaks to the solutions. One contestant with 260 points is the single leader of the day, followed by another seven contestants with 200 points. There are many perfect solutions to task “tracks” of today. We are quite excited about the further progress of the competition. There will be another post soon after the competition ends. The Institute for Informatics, namely Prof. Andreas Heuer, is chasing the media to make them report about BOI 2013. Success! There has been a nice article in the main regional newspaper (Ostseezeitung), and a video report in the news broadcast of a regional TV station (TV Rostock). TV Rostock, April 9: link to the day page of April 9. Click on “Nachrichten: Neues aus der Hansestadt” to see the news broadcast. The BOI 2013 report starts after about 2/5 of the video. 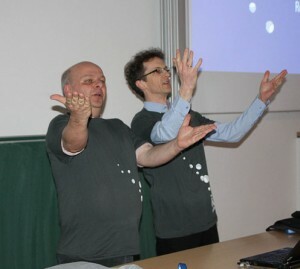 In a surprising move, BOI 2013 chairmen Lutz Hellmig and Wolfgang Pohl dropped their jackets, put on the official contest T-shirts, and declared the 19th Baltic Olympiad in Informatics open. This was the end of a brief opening ceremony that gave varied impressions: of the guides, the teams, the development of BOI, the City and surroundings of Rostock, an finally of Rostock university with its Faculty of Computer Science and Engineering and its Institute of Informatics. As special guests, the faculty’s vice dean Oliver Staadt and institute director Peter Forbrig welcomed the nine delegations from Denmark, Estonia, Finland, Latvia, Lithuania, Norway, Poland, Sweden and, of course, Germany. The ceremony was accompanied by a brillant guitar duo, and followed by similarly brillant food at the reception (delivered by Studentenwerk Rostock). All teams had arrived more or less in time; only two Estonian contestants will arrive late: on Tuesday morning, just minutes before the first competition starts. Good luck to everyone on the first day – challenging tasks are waiting for you! We are proud to present sponsors and supporters of BOI 2013 on the “Hosts” page. A general sponsor of all our OI activitities is Max-Planck-Institute for Computer Science. Furthermore, German Computer Society (GI) is providing a generous grant to BOI 2013. Other sponsors are “IT-Initiative Mecklenburg-Vorpommern” and AIDA Cruises. Another great honor: It has now been confirmed that BOI 2013 is organized under the auspices of Mathias Brodkorb, Mecklenburg-Vorpommerns State Minister of Education, Science, and Culture. To all our sponsors: Thanks a lot! Dear prospective participants in BOI 2013: Welcome! 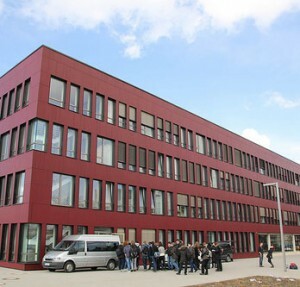 BOI 2013 will be organized in Rostock, Germany, and hosted by the Department of Computer Science of Rostock University. We will present other partners later. BOI 2013 will take place from April 8-12. A detailed schedule will be presented soon. Best wishes, welcome in Germany, welcome in Rostock!